The digital revolution already apparent in other industries has yet to become mainstream in the health sector, with disruptions coming from improved patient engagement, connected care, unobtrusive monitoring, assisted living for people with chronic conditions, independent and active ageing, and robotic/remote surgery. The health care industry is the biggest and fastest growing industry in the world. In the European Union, the cost of providing health care is projected to rise by 15% by 2060, accounting for 8.5% of the GDP, when 1 in 8 people in Europe will be 80+ years old. Connected health, with a variety of use cases opens a whole new landscape of business opportunities for industry, new jobs and prosperity. The potential improvement enabled by 5G for patients, doctors, care givers and society is huge. 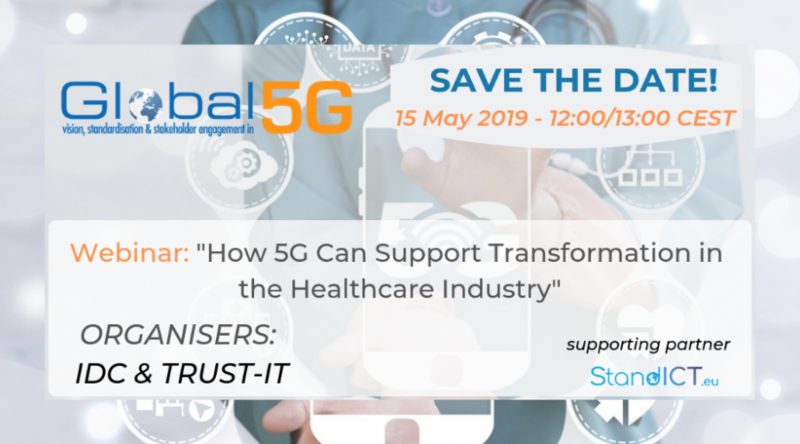 To understand the opportunities and the challenges of 5G, IDC and Trust-IT present the webinar "How 5G can support Transformation in the Healthcare sector" on 15th May 2019. The webinar presents an opportunity to listen to experts discuss the needs and benefits expected by healthcare industry stakeholders, as the sector drives transformation.